On our other page, Coaster Talk No BS Zone, we talk about more of the experience and technical aspects of our visit on this year's opening day. Today we will go through a historical tour of what we rode and experienced at Kennywood on opening day 2016. One of the greatest things about this park is that there are so many different historic attractions to appreciate and enjoy. In western PA, Kennywood is not just a place to go, it is a way of life. As a teacher, I hear the kids talk about Kennywood visits as the event of the year. The heart of the park, the iconic 1920s wooden roller coasters, the 1927 Grand Carousel, and many of the park's buildings, ensure that every living visitor to Kennywood has a shared experience with today's visitors. This is especially impressive when you look at many other parks from this era that have disappeared or have scrapped many of their historic attractions. Thanks to this commitment to the park's heritage, Kennywood has the National Historical Landmark designation, a status that only one other amusement park has achieved. For this reason and the joy that these attractions have brought to the hearts of so many generations of visitors, Kennywood is an absolutely must-see attraction for anyone who enjoys amusement parks. Anywhere you go throughout the Pittsburgh area, you are likely to run into a Kennywood arrow sign. Opening ceremonies for the 2016 season, with a school band serenading us. This park has played such an important role in the lives of so many people. Kennywood is a park for the entire community. The park is home to the first jobs of many young people throughout the region. Every time that we visit I am greeted by someone that I know, often times by kids that I've taught that are working in jobs throughout the park. It is so special seeing these young people grow up at the park. The pivotal role that a local amusement park plays with the surrounding communities cannot be overlooked. Kennywood is not just a place to go, it is a way of life. Jack Rabbit dates back to 1920 and is tied for the fifth oldest coaster in the world. While the Jack Rabbit up at Seabreeze in Rochester, NY is just older than the Jack Rabbit by just a few weeks, I basically consider them to be tied in age. Both the Kennywood and Seabreeze Jack Rabbits were designed by John Miller, a famed roller coaster designer. They were the first coasters to utilize up-stop wheels. Up-stop wheels run underneath the track and allow the train to do more aggressive maneuvers than the side friction coasters that were built prior to this. The innovation of up-stop wheels is used to this day on roller coasters. This 96 year old coaster still delivers. The ejector airtime on this coaster is about as good as any there is out there today. The Racer was also designed by John Miller. It dates back to 1927 and it has one of the most stunning structures that I've ever seen on a coaster. The coaster is a Möbius loop, meaning that it has one continuous track. While the coaster appears to be two separate coasters, it is actually one track with two different trains. It is disorienting because the train ends on the other side of the station. The coaster runs trains that were produced by the Philadelphia Toboggan Company. Thunderbolt is the result of a reconfiguration of the Pippin, a John Miller design that dates back to 1924. It was reconfigured into the Thunderbolt, with these giant swooping drops over the midway. There is nothing like watching and hearing the screaming riders heading into the "spaghetti bowl" of drops on the Thunderbolt. This coaster's design is unlike any other. On your average coaster, this section would usually start the ride. This section does not come until the middle of the ride. As soon as you leave the station, you take a giant plunge down a cliff, and you take multiple cliff dives throughout the ride. No other coaster even resembles this awesome creation. This coaster interacts with its much younger sibling, the 225 foot cliff diving Phantom's Revenge. This park boasts four awesome dark rides and attractions, including Ghostwood Estate, the Garfield's Nightmare old mill "Tunnel of Love" style ride, the Exterminator a spinning indoor coaster, and this attraction, Noah's Ark, a walk through attraction that has recently been completely redone and built to more closely resemble this ride as it did earlier in its 90 years at the park. The entrance of Noah's Ark was redone to have this giant whale figure as the entrance. This hails back to an earlier design of the ark that was sorely missed by many of the older patrons to the park. The results of this renovation are spectacular. Kennywood has a way with renovating and updating older attractions, keeping the best parts of these attractions and building out from that. Noah's Ark is an excellent example of this, along with Thunderbolt, and the next awesome attraction we are going to look at, Phantom's Revenge. Phantom's Revenge is as exhilarating as any steel coaster out there. It is tied for my favorite steel coaster overall. We travel all over the place to visit different amusement parks and Phantom still tops our list for our overall favorite. There is nothing quite like dropping 228 feet down a cliff at 85 MPH. This is another one of the great transformations that Kennywood has undertaken. Steel Phantom was built in 1991 by Arrow Dynamics and featured four inversions. In 2001, the Steel Phantom was transformed into Phantom's Revenge by Morgan Manufacturing. They did a masterful job extending the drop and length of the ride, in addition to including a ton of airtime inducing hills. The first hill is approximately 160 feet tall. This swooping drop is incredible. Phantom shares the same cliffside as Thunderbolt. Both of these rides are one-of-a-kind masterpieces. The spectacular ride is further enhanced with the spectacular views down to the Monongahela River, the Great Allegheny Passage Trail, the Edgar Thomson Steel Works in Braddock, and the Lincoln Highway's giant Westinghouse Bridge in Turtle Creek. The most famous food option at Kennywood is Potato Patch Fries. This place goes through potatoes by the pallet on a daily basis. These hand-cut fries are spectacular and this is one of the few food places I have seen in a amusement park that gets lines of people waiting as if the food stand was a ride. One of the coolest things about Kennywood is the fact that they have several rare and last of their kind rides. This is the Turtle, a tumblebug ride that was created by Traver Manufacturing, a legendary company that was once based out of nearby Beaver Falls. At one point, these rides were a mainstay at amusement parks, but now there are only two remaining, this one, and the Tumblebug at historic Conneaut Lake Park. This one is kept at a more mild speed than the one at Conneaut, but it is still tons of fun. The circular fashion of ride seating areas lends to a great social experience. Everyone rides the Turtle, and that is one of the many aspects that makes this ride really special. In our ride car on this visit, we sat with a mother with two young children, one that was about four years old, and the younger one was no more than two years old. In another car there was a grandmother riding with her little ones, in addition to a young couple. Rides like this really help to bring the community together. The Auto Race is the last of its kind. It was also made by Traver and it is a ton of fun. It dates back to 1930. Adjacent to this ride is the Olde Kennywood Railroad, which was purchased after it was used in the the 1939 New York World's Fair. The park's 90 year old Grand Carousel was produced by the Philadelphia based famed carousel builder William H. Dentzel in 1926 for the Philadelphia Sesquicentennial. Due to a delay in production, the carousel was never used for that celebration and it was installed at Kennywood in 1927. The carousel sits in the middle of the park, a fitting place for the crown jewel of the park. The Kangaroo is a Bartlett Flying Coaster, the last remaining ride of its kind. No visit to Kennywood is complete without taking a ride on this. This is a giggle inducing thrill ride that is a ton of fun. The park also has other classic rides including a Schwarzkopf Bayern Kurve, a Mangels Whip, and a Huss Enterprise. The park also has a terrific train ride that was created for the 1939 New York World's Fair. Sky Rocket is the latest coaster to be added to the park's collection. This coaster was built by Premier and it debuted in 2010. This is a crowd favorite and a very fun ride. The arcade is one of Brit's favorite places to be in the park. There is a nice mix of classic and contemporary arcade games. Kennywood is a well rounded park that has a great collection of classic and modern rides. This is one of the last great American urban amusement parks. Many of these places have closed since the 1960s such as Philly's Willow Grove Park, Cleveland's Euclid Beach Park, New York/North Jersey's Palisades Park, and others. This makes Kennywood a priceless treasure and a place that you must visit as often as you can. 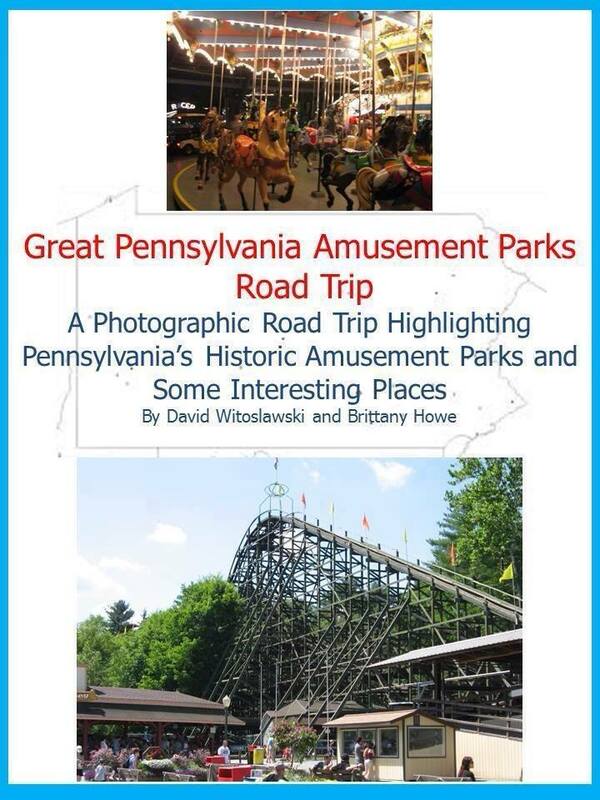 If you are interested in the different amusement parks throughout the state, be sure to check out our book, "Great Pennsylvania Amusement Parks Road Trip." It is available through local bookstores, online, and through the drop down menu near the top of this page.